In most of my music therapy groups this week I dedicated time away from engaging in music but rather to engage in conversations around music and mental health since May is mental health awareness month. I know some of you just gasped and thought, how dare a music therapist do a session without engaging in music ! Well, I did and it was quite powerful! In most of the sessions the clients were engaged in some deep and emotional discussions around music in our culture and artists that have contributed a great deal to our music as art; many from their own experiences with mental health challenges. Artists names such as Michael Jackson, Amy Winehouse, Britney Spears, and so many others came to surface. Clients shared that these artists music has touched their lives in so many ways over the years of their personal struggles with mental health issues. Some have expressed, “It was the only thing that got me through” while others expressed “It was a relief to know that I was not alone”. Client's have described these songs as being a "source of strength in times of adversity". I encouraged the clients to share songs from artists who gave them words of encouragement that in turn were also dealing with similar mental health challenges. Music in all forms has been therapeutic for centuries and I want to highlight that even though many of these artists songs are therapeutic I want to honor and thank them that they had the courage to step into vulnerability and share their hurt and challenges through words and song with us. These artists shared personal stories in their songs that continue to support, validate and help many of the clients that I work with in our music therapy groups. This month let's recognize that much of the music we listen to on a daily basis very likely has been a form of music therapy for the individual artists themselves. Its been a way for them to share their story, their pain and help support others along their journey. That's the beauty in music and creativity -- it can often come from pain but then transform into something beautiful and powerful, similar to the Eminem song, “Beautiful Pain”. I encourage you to share your story, share your song, share your art and help others find comfort and peace and normalize that mental health issues are real and we can shed some light in the darkness. Please share, like and leave your comments below as I love to hear from you. Once school starts, most teachers will be very attuned to each child's needs in their classroom. Perhaps you've gotten a call to have your child taken from class because of your child's performance, behaviors or even social isolation? If this happens, it can make the transition even more stressful for both the parent and the child. What about music therapy? Maybe you've never even considered it. This form of therapy has been around for almost 80 years, yet surprisingly people are still unaware of its effectiveness, particularly for helping children with special needs. Autism Parenting Magazine Lists Music Therapy/Mewsic Moves as a Resource! Last year the Autism Magazine also awarded us with the Top Music Therapy Writer for their magazine in 2014! Just last month they have created an online resource for parents and I am so excited to announce that Mewsic Moves has made the list! We are so grateful to the Autism Parenting Magazine for all they do for families across the country, online and around the world. Thank you for being such a great tool and resource for so many. You can find the resource list by clicking HERE. 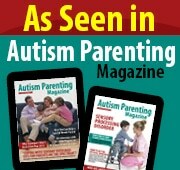 You can also get your FREE copy of the Autism Parenting Magazine by clicking HERE. Please share this resource with families of children with special needs and others who may benefit from any of these resources. Have you ever asked your child to put something "in" the box and he/she puts in elsewhere? Then it is most likely that you child may have challenges with differentiating basic concepts such as in, on, over and under. I have worked with many children who are confused with these everyday concepts and have no idea how to differentiate between in, on, over and under. This is a common challenge for most children and especially common for children with special needs and those on the autism spectrum disorder. Over and over again I have parents and other professionals asking me how I teach children how to differentiate between these concepts. I simple tell them, "I use music" as a fun and motivating tool to help them learn, understand and practice these basic concepts. Just the other day I used the drum to help a 3 year old boy on the spectrum differentiate between "on", "under" and "in". We were singing 5 Little Monkeys jumping on the DRUM. I revamped the lyrics to make it more applicable in our music therapy session. When we were done with the monkey I asked him to put the monkey in various locations such as, "on the drum", "in the drum" and "under the drum". The little guy had so much fun hiding the monkey in all the areas he had no idea he was learning these concepts. After this session I was inspired so I wrote a song to help you and your child learn these basic concepts through music. Feel free to adapt the words of this song to make it your own as well as to match the concepts to the particular environment for you and your child. In this song I kept all the concepts familiar to a music therapy setting (as it's mostly my working environment), but you may want to adapt the lyrics to school or home. For example, the first line is "I put my mallets in the box when it's clean up time". You may want to change it to, "I put my crayons in the box when its clean up time. Please feel free to share your personal lyrics with us as we love to hear from you! I hope you and your child will have fun learning these basic concepts and finding creative new lyrics to adapt to your particular environment. Have fun making the most with MEWSIC! Download the song here! or by clicking the image to the right. Click below to hear a sample of the song. I recently read a blog on the top 5 qualities to look for in an individual therapist or family therapist. It got me thinking. What do parents or other professionals look for in a music therapist? What are the key qualities to look for in a music therapist? Here are the qualities I have come up with for top 5 qualities to look for in a music therapist working with children. It is very important to find a music therapist who works well in a multi-disciplinary team. When I first began my practice I was so "green" and I consulted with other therapists such as Occupational, Physical and Speech Therapists. I learned so much from them and more over, I learned how to work together to make sure the best success was achieved for the child. Make sure that your music therapists has a wealth of consulting and works well with others in the child's team support system. It is important for a music therapist to be creative. It is often imperative that a music therapist be able to make up songs and activities "on-the-spot" to match your child to where they're at. A music therapist often needs to adapt songs and activities to engage or motivate a child in the desired activity to achieve various goals. Just because a music therapist has a bachelor or masters degree it doesn't end there. Music therapists are required to follow up on continuing education and researching the latests educational resources in their specialized client population. Working with children with special needs, especially autism can be most challenging at times. It is very important that the music therapist you are seeking to work with your child has a deep desire and compassion to work with children with special needs. You have every right to ask your therapist what inspired them to choose to work with children with autism. It is also crucial that music therapists working with children with autism have a great deal and gift of patience. Considering children with autism function and experience the world in different ways than we do, it is crucial that the music therapist you choose has a great deal of patience in waiting and understanding how your child acts or reacts in certain situations. Working with children with special needs considers a great deal of problems-solving skills. It's imperative that the music therapist that you choose can "think on their feet" and come up with a solution that your child is dealing with through a musical activity or therapeutic intervention. You can simply ask your therapist in an interview, "what is the most challenging client you have worked with and how did you problem-solve to come up with a solution?" I hope you find this list helpful in choosing the music therapist that is the best fit for you and your child's needs. For a list of music therapist in your area you can contact your local music therapy association or the American Music Therapy Association website. If you have other qualities that you think are important I would love to hear from you, please write them in the comment section below. Mewsic Moves Wins an Award! Why is it Important to Teach Your Child to be Thankful? 10 Years as a Music Therapist And Still Using The "Top 10 Greatest Hits"
The Reason I Jump: Understanding Autism - "A Must Read"
Have you ever wondered why those with autism jump, flap their hands or make high pitched noises? This book answers all those questions that I once had as a student in this field. Rarely do I read a book all the way through in a week, let alone one night, but this one I just could not put down. I first heard about this book through social media posts, and then when I saw John Stewart interview co-author David Mitchell on The Daily Show. I ordered the book on Amazon the next day. I wish this book was available to me when I first started my career as a music therapist! This book offers tremendous insight into the inner world of those living with autism, and does a great job explaining the reasons for various behaviors and reactions. This book gives answers to questions that took me many hours to understand with my clients. This book will serve as a refresher for those with lots of clinical experience with this population. For everyone else, this book is a great read and a real eye opener about what it means to live with autism. Why do you flap your fingers and hands in front of your face? Why don't you make eye contact when you're talking? Why can you never stay still? One of my favorite sections from the book relates to how people talk to those with autism. The interviewer asks the question, "Do you find childish language easier to understand?" Naoki, a 13 year old with autism replies , "whenever anyone treats me as if I'm still a toddler, it really hacks me off." I observed this many times in my practice, and this was mostly done by their parents! I have long encouraged parents to speak in an "age appropriate" manner, both with language and expectations. There are lots of gems like this in the book, and I highly recommend this book to all professionals working with this population. I am so thrilled to announce that I have received the “Top Music Therapy Writer” award from Autism Parenting Magazine for 2014! This is a terrific magazine that provides education and support to families of children on the spectrum. The Autism Parenting Magazine was also proud recipients of the 2014 Gold Award for Online Resources (websites, eMagazines and blogs) in the category of Family/Parenting from the Mom's Choice Awards®. Music Therapy is NOT the Same as Music Lessons ! I encourage you to check out this excellent magazine! Also, look for more articles from me this year. If you have questions or are interested in learning more about music therapy, please reach out to me. Your question might even inspire me to write my next article! Click on the picture to the right to subscribe to the Autism Parenting Magazine. Over the years parents have asked about buying musical instruments for their child. I think these make great gifts, because they help the child engage in music making at home, which helps to reinforce what was learned during the music therapy session. 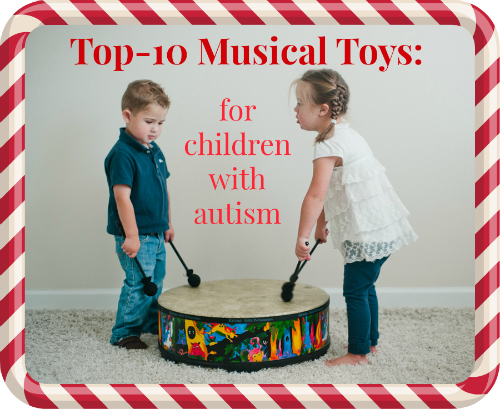 Here are my top ten musical instruments I recommend for children with Autism. For each one, I explain how the instrument can be utilized in a therapeutic and beneficial way. What a great dual purpose, a toy that’s also beneficial therapeutically! ( you can also click on each image or title for more information on the instrument). The small size of the ukulele makes it great for small children and adolescents. It’s lightweight and narrow neck make it easy for the child to grasp. I find the Ukulele is useful for fine motor control when picking or strumming. You can also work on gross motor control if you rock the arm up and down to create strumming patterns. The Ukulele is also great for working on eye-hand coordination. 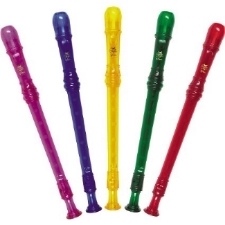 Recorders are very popular with children and come in many colors. I often use this for language and speech development, primarily to aid in breath support and control. The recorder is also useful for working on fine motor skills that are needed to create different tones on the instrument. I enjoy using the Sound Shapes®, because they are colorful, fun and come in different sizes, shapes and sounds. Sound Shapes® are easily stacked they don’t take up much room like most other stand-up drums and they are lightweight. The Sound Shapes® can provide therapeutic value in supporting eye-hand coordination, impulse control and to provide controlled sensory input. Hand-bells come in various sizes and price ranges. I like these because they have a smaller scale (8 notes), are less expensive then others, and are quite durable. They are useful for developing fine motor skills, since you can simply press the top with your finger to make a sound. You can also use them to develop gross motor skills if you pick them up and ring them. I often use these to increase reading skills as well. I create color-coded music, which the child “reads” by playing the correctly colored bell. This also helps with visual tracking skills. Cabassas come in various sizes. I prefer to use the larger ones, particularly if I want to use sensation and movement in my therapeutic approach. The weight of the cabassas can be useful for grounding a child, and you can roll the cabassa on the child’s arm, legs or back to create different sensations. A word of caution here – you should practice on yourself before using it on the child so that you know to use the right amount of pressure. The cabassa also can be useful for fine and gross motor skills, as well as visual and auditory stimulation when you roll it around and around. I often use the Melodica to support a child’s fine motor skills, breath control and eye-hand coordination. This is a less expensive option to purchasing a piano or keyboard. Of all the drums I use in my practice, the Ocean Drum is by far the most popular. This drum comes is different sizes and colors. I prefer the ocean drum with fish inside, since it provides added visual stimulation. This instrument can be used to aid with relaxation, grounding, sensory-input, gross motor and impulse control. The sound of the ocean drum ranges from a loud crescendo of crashing waves to the gentle white noise of the sea foam bubbles dissipating on the warm sand. Castanets are fun, small and the least expensive instrument that most children love to play, mainly because they are touch-responsive. I have used this instrument to help children slow down from a fast paced-rhythm to a slower more regulated rhythm. This can be used as an auditory cue for children to understand their current energy levels and how they can learn to self-regulate. This instrument is also useful for developing fine motor skills, particularly for differentiating between using and isolating different finger movements. I recommend buying a less expensive keyboard for therapeutic use. Children particularly seem to enjoy keyboards whose keys that light up as they are played. I use keyboards to help with fine motor skills, as an outlet to help children be creative and have fun on their own without direct instruction. Make sure your keyboard has a record button so your child can record their creative masterpieces and play it back. This helps them to feel good about their accomplishments, and allows them to share their work with others. This is particularly useful to enhance social skills and to promote sharing. Like most of the instruments listed here, xylophones come in various sizes, colors and prices. For use at home I suggested something smaller, more colorful and less expensive. I prefer the wooden xylophones since they produce a lower-pitched sound, which helps to prevent over-stimulating a sensitive child’s auditory system. The xylophone can also help with a child’s eye-hand coordination, impulse control, gross motor skills as well as reading skills if you use color-coded music to match the notes on the xylophone. I hope you find these list of instruments helpful in bringing some of the therapeutic benefits of music into your home. Please feel free to reach out to me if you have any questions about the appropriateness of a particular instrument for your child. If you are not working with a music therapist already, in most cases I can refer you to a qualified therapist in your area that can support your child’s development through music therapy. 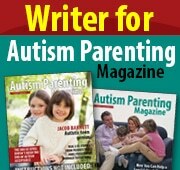 This article has also been featured in this December issue of Autism Parenting Magazine. Why not give the gift of music this holiday!